Are you looking for guard shack companies online? Panel Built offers a great variety of units you can use wherever you need them. Purchasing your guard shack online will save you time and money while offering you the flexibility you need for your unique space. Whether you are running a construction site or managing a local event, having portable buildings can make your job a lot easier. These units are easy to install and easy to move, which means you can use them over and over again, wherever you need them. At Panel Built, we want you to have the best experience possible. We know that modular structures can be at least as sturdy as traditional buildings at a fraction of the cost. Choosing a modular building is an easy choice: you will save time and money and receiver high quality product designed to last you for years. 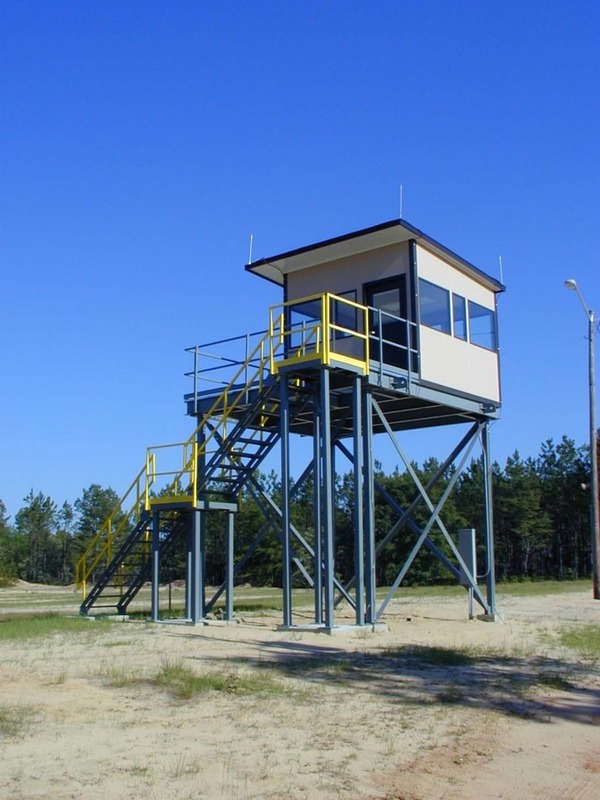 Whether you are protecting an apartment complex or a construction site, having a guard shack enclosure is an excellent option. The building helps provide safety and shelter for your security personnel. This is a great tool to keep your employees comfortable during long work hours. These units are flexible and can be expanded to include extra space. Your modular guard shack will typically hold up to two or three security employees, compared to a booth which usually holds one. We offer a variety of different features to help create the perfect space for your needs. In addition to color choices, your prefab guard shack includes a choice of windows, flooring and doors. Some units even feature heating and cooling. We know that every business has different needs. We want you to be able to provide the right level of comfort at the right price. We can help ensure that your security is safe and comfortable. Each unit includes a lockable door as well as full windows. For an additional fee, you may be able to add bullet proof glass. Safety and quality are our number one priorities. Let us help you protect those who watch over your property. We simply offer the best available prefabricated guard booth for sale. Call us today to find out more about our guard shacks. When hosting an event, a ticket booth can help you manage the flow of traffic. Ticket booths are an excellent way to monitor how many people are entering an event and to collect any fees associated with your party. Employees collecting tickets and money can spend hours standing on their feet in the hot sun or cold weather. Using a gate house will help keep employees and volunteers safe from hot temperatures. Our cheap modular guard shacks online come in different sizes to accommodate your needs. Each unit can fit at least one worker, with room for a stool to sit on. In addition, the booths feature large picture windows and sliding windows on the side to allow for easier access to customers. You can include shelf space as well as heating and cooling options. Each unit can be hooked up to electricity to allow for evening events. You do not need anything fancy or expensive. Our cheap ticket booths available for sale provide everything you need at an affordable price. You do not have to worry about spending extra money for frills you simply do not need. Let us help you get the right booth for your event without breaking the bank. One of the best parts about purchasing a modular building is the ease with which they are installed. Depending on the type of building you purchase, your unit may already come preassembled. You’ll simply need to put it in the right place and get to work. We have created these modular units to be flexible and movable. This is ideal for communities or businesses that may not need to use the booths all the time. They can easily be moved for storage. If you need to move frequently due to the nature of your business, your modular shacks and booths are very easy to transport. We understand that many businesses will need to relocate these units at least once, some many more times. That’s why we’re built our units strong enough to withstand transportation. Because each shack and booth need to be able to be transported they are often more stable than some permanent structures—for a fraction of the cost! The majority of the construction needed on your unit will take place off site. This eliminates unnecessary on-site disturbances and traffic. After ordering, we’ll deliver your unit to your designated place of install. Within a short time, your new structure will be ready to use. With over 20 years of experience, Panel Built is the number one choice for modular buildings. We offer high-quality structure at low cost, so you can get your job done right. Let us help you with your guard shacks and ticket booth orders today. You can save time and money when your order a prefabricated building for your needs. Call today and let one of our talented customer service agents answer any questions you have. For more information on the type of modular buildings we offer, visit our website.